Shaniko itself has a legacy dating back to the days when wool was king. Trains, stages and riders made their way to the town, which, back in the 1880s, was called Cross Hollow. 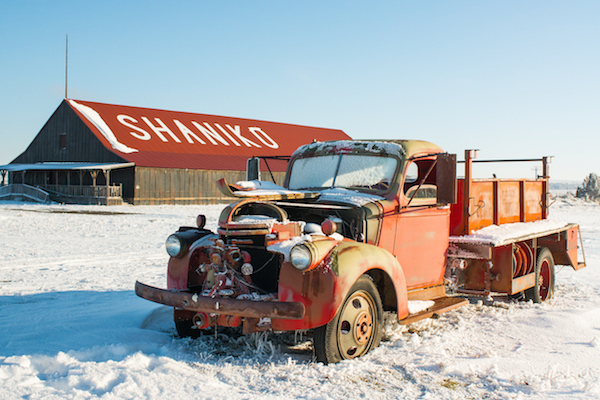 That name gave way to Shaniko for its first postmaster, pioneer August Scherneckau, whose name the area’s American Indians pronounced “Shæn-ih-koh.” By 1903, Shaniko had become the “Wool Capital of the World” after three concurrent sales brought in the largest total sale of wool on record to date. The next year, sheep farmers sold an estimated five million dollars-worth of wool to buyers in Shaniko. The glory was short-lived, though, as the railroad from Bend to the Columbia River (completed in 1911) bypassed Shaniko, initiating the downfall of the town. The town’s misfortune compounded when a fire burned down many of the buildings. Sherman County lies to the north. Despite the area being well traveled by early pioneers, it has no record of a single emigrant from the Oregon Trail settling here, probably due to its dim prospects for raising cattle. 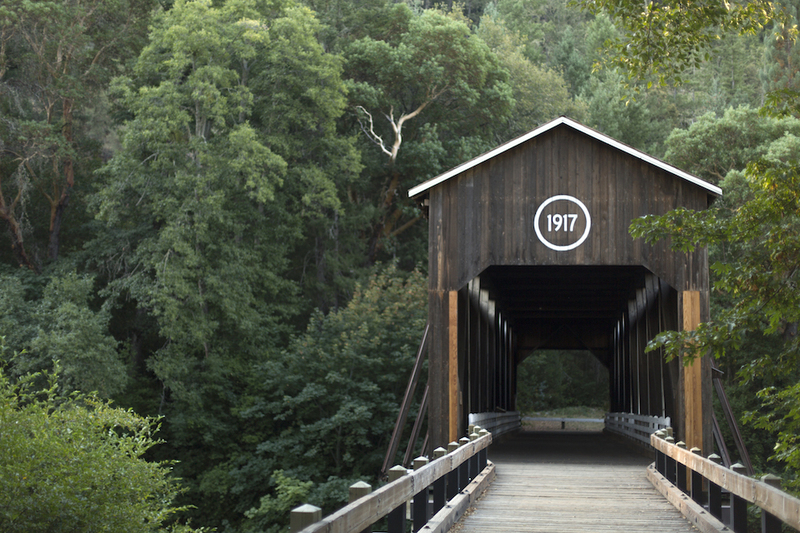 Named for Union Army General William Tecumseh Sherman, this county is sparsely populated. 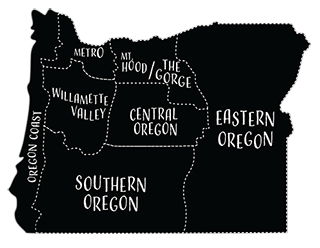 In the 1880s, the children and grandchildren of the early emigrants “bounced back” from the Willamette Valley to settle in Kent, Grass Valley, Moro, Wasco and Biggs. Evidence of people is sparse, but silos of concrete and corrugated steel are not. Sagebrush is about the tallest natural vegetation other than the wheat fields to the north. Tumbleweeds are more common than people, and when the wind howls, uprooted sagebrush tumbles along the wind’s trajectory until it snares on the next wire fence. These plains, however, are not without life. 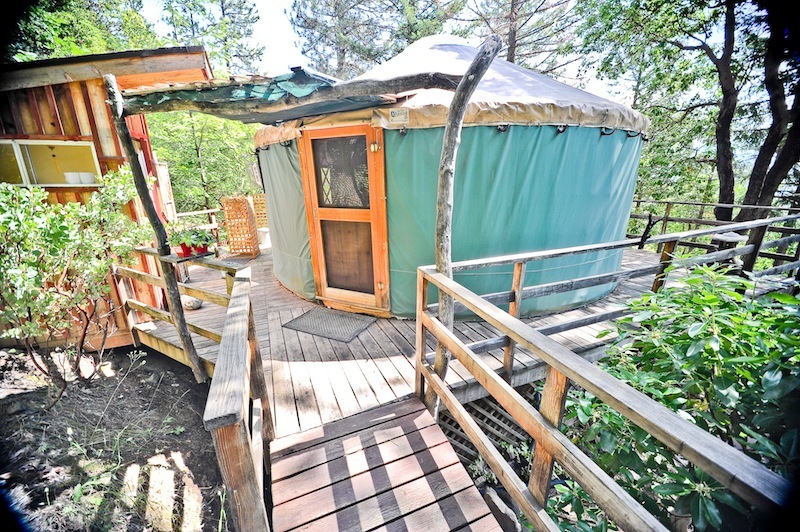 They are home to a wide variety of wildlife, including pheasant, jackrabbits, hawks, eagles and an occasional antelope. Don’t blink in Kent. 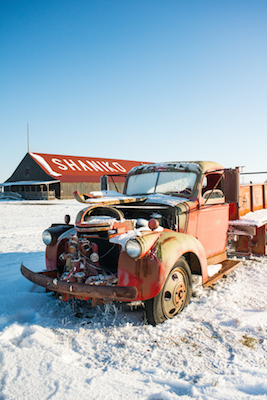 With a reported population of twenty-three, it’s more of a ghost town than Shaniko. 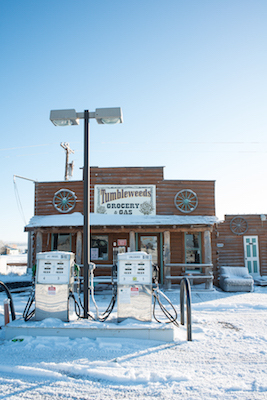 The vestige of a gas station and café—long abandoned to the elements—sit along the highway. A couple of tall grain silos stand sturdy against the wind, sun and rain—monuments to the people who eke a living from the hardscrabble land. Moving north, Grass Valley is a place where you can stop and rest for a while. 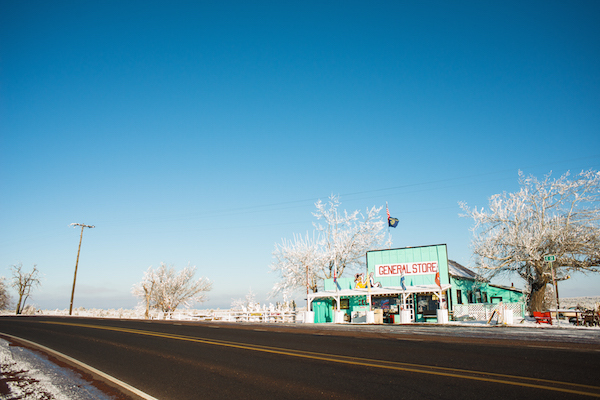 Even though there’s no market—“Last Groceries For 67 Miles” a sign reads—there’s a charming restaurant where locals and visitors hang out, and a gift shop to browse the American Indian-themed gifts and semiprecious stones. 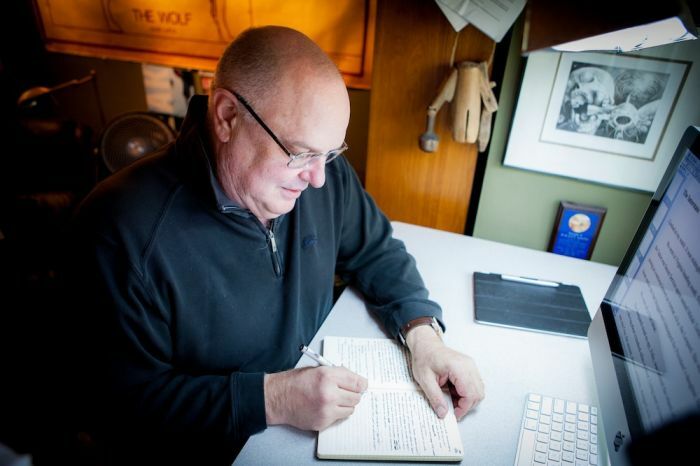 Owner Richard Bell has two dozen years in residency here but is still considering himself a “newcomer.” His remote shop has brought the world to his doorstep. “I’ve met folks from the Netherlands, South Africa, Germany, Canada and all over the U.S.,” he said. He seems to have struck a balance between isolation and interactions. 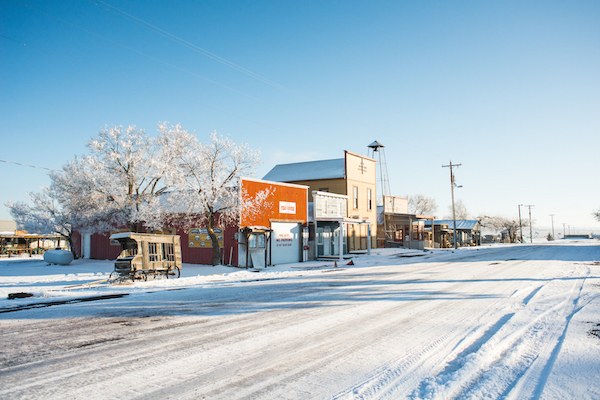 Moro is kind of the “big city” in these parts, serving as the service center and Sherman County seat of government, reportedly the smallest such seat of county government in the state. It’s a picturesque oasis of civilization, where your nearest neighbor can be miles away. Moro has a motel, a restaurant, a watering hole, a market and the Sherman County Museum, where Cris Welk was volunteering her time. “Lots of folks come in here to learn about the history of the area,” she said, showing artifacts donated by the families of early local residents. In one wing, step back into the time when refrigerators were actually “ice boxes,” where a big block of ice placed in the top cooled everything down below. “People come in because it’s a nice break from the highway, and it’s a really nice award-winning museum,” she said. The highway opens up north out of Moro into big wheat country. This area was seemingly cultivated north to south, and that’s how the harvest goes, too. The farmland to the north gets cut first, followed progressively to the southern lands. Much of the wheat is destined for Asia—particularly Japan— where it’s turned into noodles. Wasco, located a couple of minutes east of 97, is a bit of a crossroads between the old and the new. It’s not uncommon to see trucks hauling massive wind turbine parts through town. 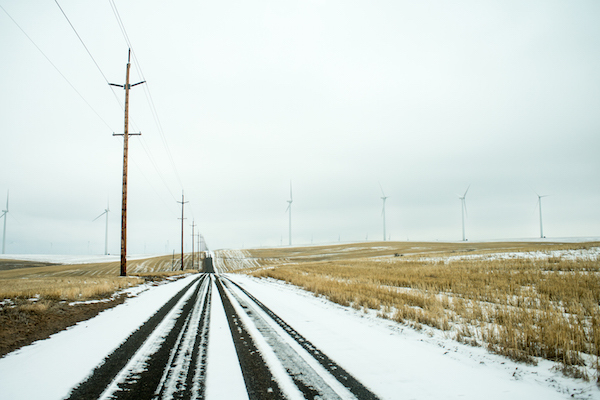 See the fully assembled turbines at work, turning wind into electricity a few minutes’ drive farther east on the Old Wasco-Heppner Highway. These wind farms, phalanxes of metal towers, stretch across the horizon, carrying power along the “Intertie” to the south. Back on 97 after a Wasco detour, the road begins to slope down into the Columbia River Gorge. Since the road was cut through the outstretched spills of lava, you can see the basaltic rock through which eons of weather, wind and water have cut. 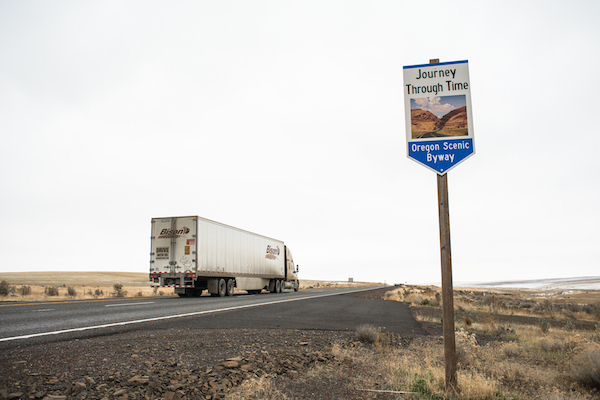 Just as you round a turn at the last milepost, you’ll see the Columbia River ahead and the modern stopover of Biggs—a place to recharge, refill your tank and recall the remote land to the south. I grew up in Wasco. Though I no longer live there, I still think of it as home. The people in Sherman County are the best. Most of my true friends are still there. I love Sherman County, where the simple things in life still matter. The only two buildings you missed in your photos was the post office and hotel. The hotel is the prize building of the town. Don't forget to stop at Oreon's newest state park, Cottonwood Canyon. It is beautiful and not far from Wasco. Discovered this place many years ago when my ex's company had booked up the entire hotel for 3 days for a company Christmas Party, mandatory Old West Style Poker theme at that. Normally closed this time of year, they opened for such thing and forever wonderful memories. Between the stroll of the historic town with its old buildings and wooden sidewalks, the "museum" of sorts, and the snow, pictures were amazing! I grew up in Moro the first 18 years of my life. It was a great place to spend my childhood and adolescent and teen years. These were the days when you spent all day outside, making your own fun and adventures, sleeping outside overnight in your yard with your friends and being able to count on anyone for anything that you needed. I treasure many memories that I had there. My parents still live in Moro and we get there from time to time. Wonderful place worth visiting! In the early 70's my father, my 5 year old son and I took a motor trip around Eastern Oregon, stopping at Shaniko to have lunch with the "Ghosts", who were retired folk, dressed in period clothing and ate at a communal hall. If I remember correctly they lived and were subsidized by the State of Oregon in Shaniko, or the surrounding area. 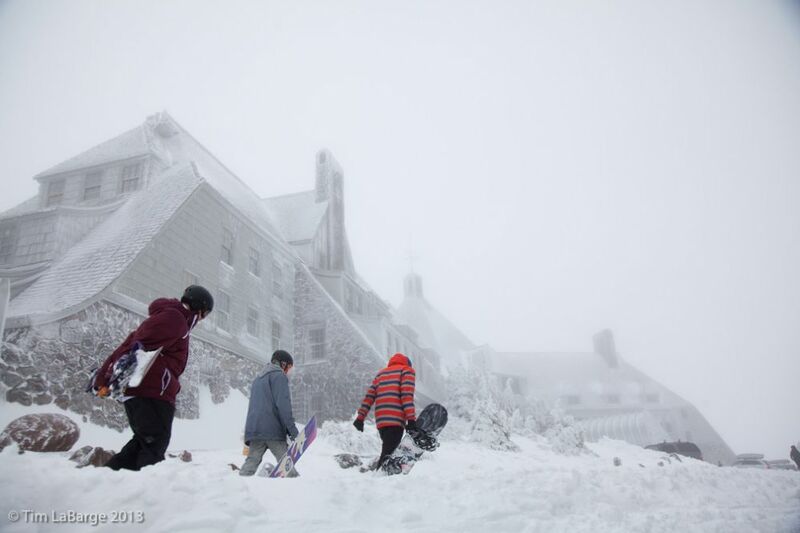 Have never forgotten the great experience…. Thanks for sharing this I am from England UK and I visited friends in Washington State in 2013 we made a trip to Shaniko, this brings back fond memories !!! Nice to read this article – we did the ride in 1994 and it was georgeous. Love this part of Oregon very much! Really enjoying your notes on Face Book.